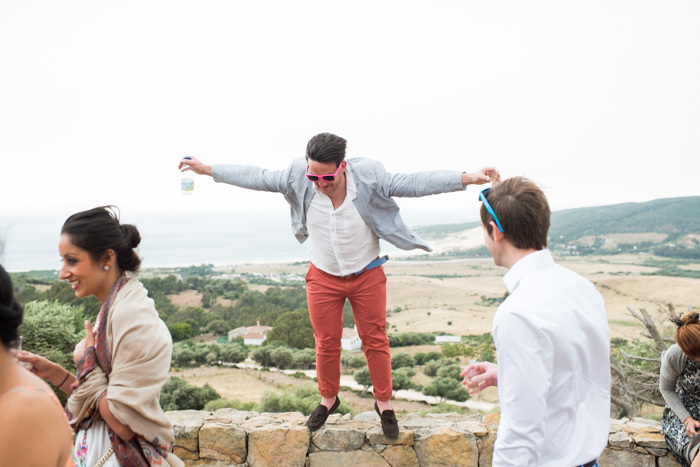 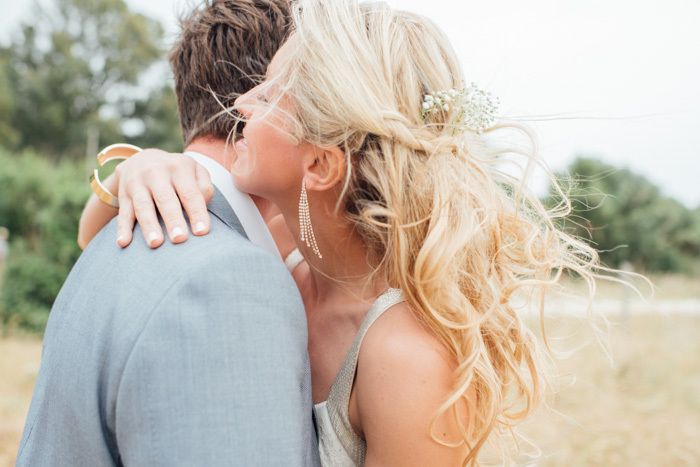 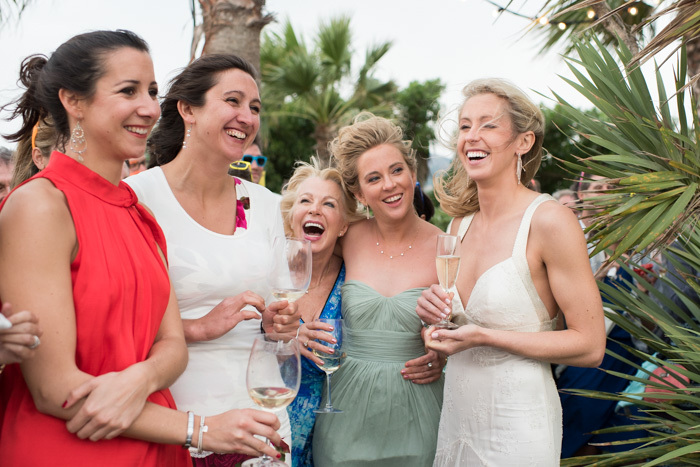 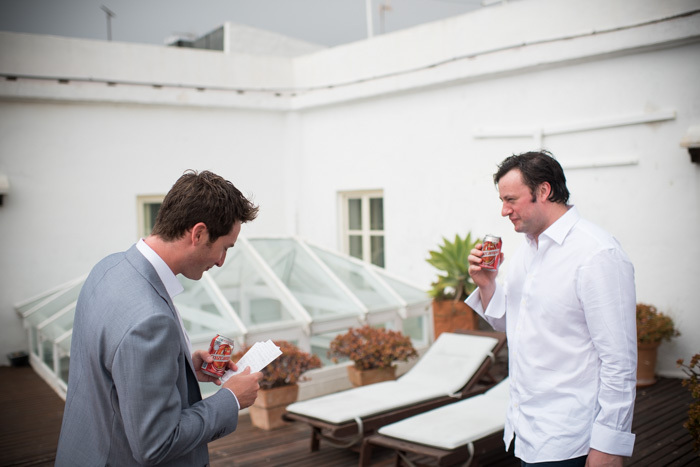 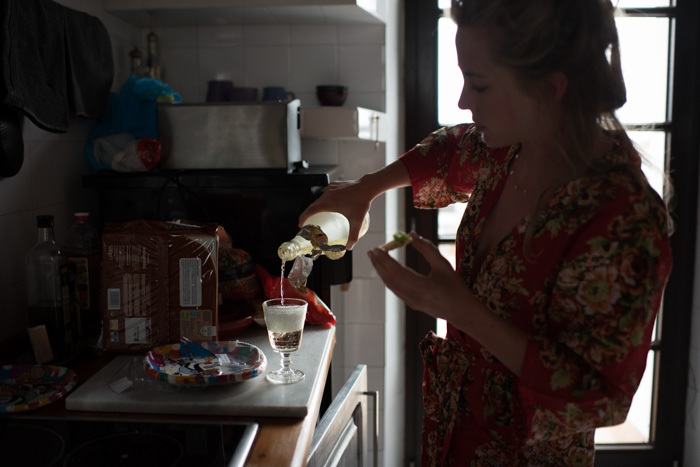 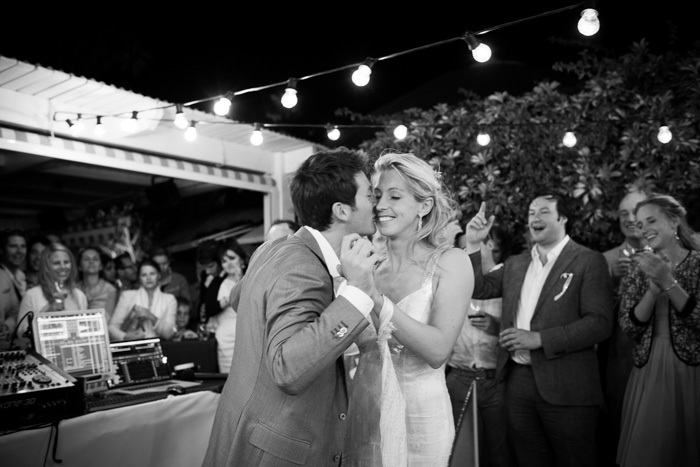 As soon as I know I have a wedding in Tarifa booked I start to get excited. 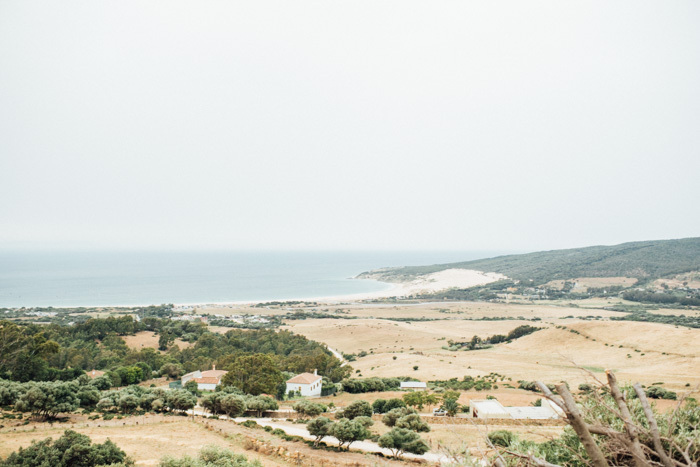 The location awakens my inner hippy …and when you combine Tarifa’s boho chilled charm with timeless British elegance and style then you get perfection. 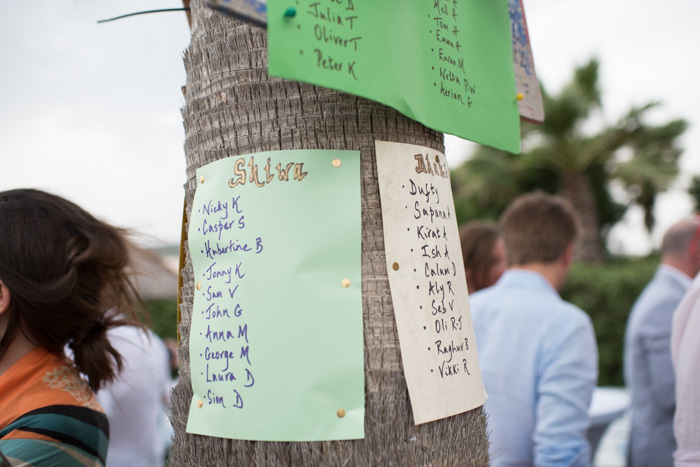 Which is what we had at Ben and Karen’s wedding. 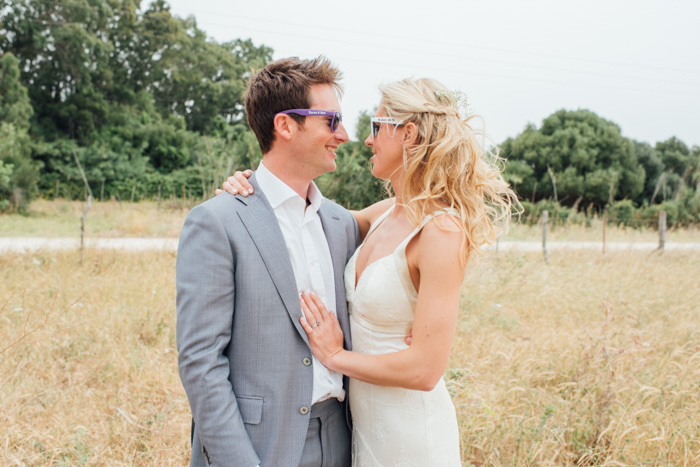 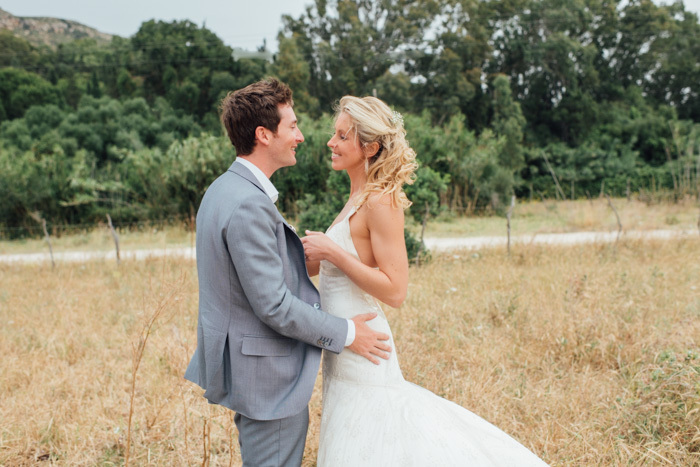 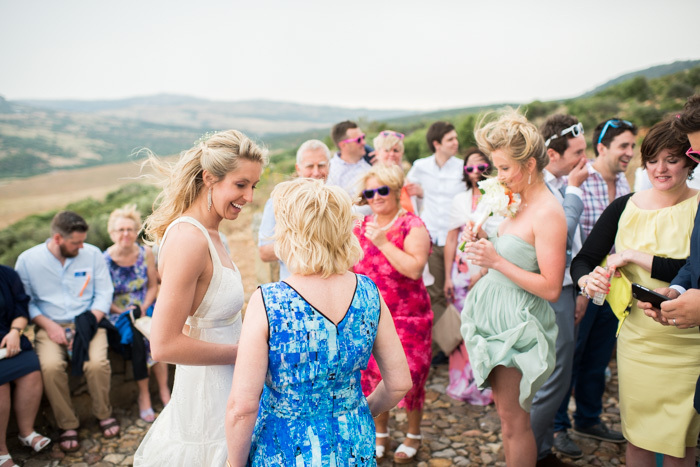 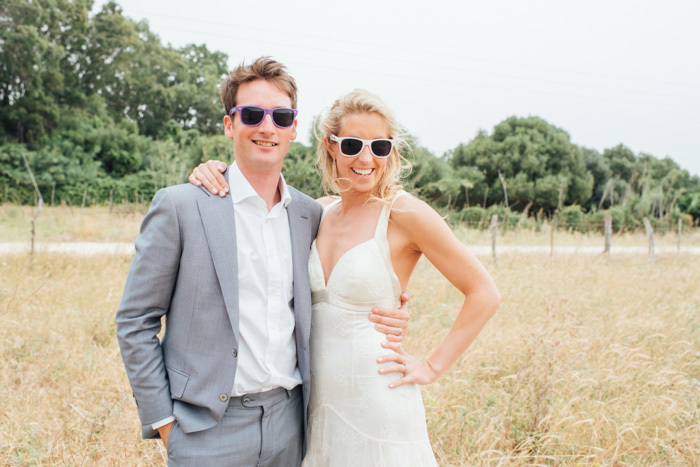 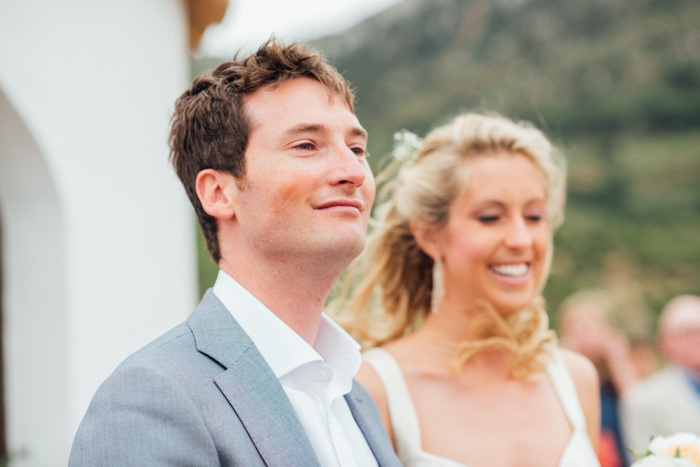 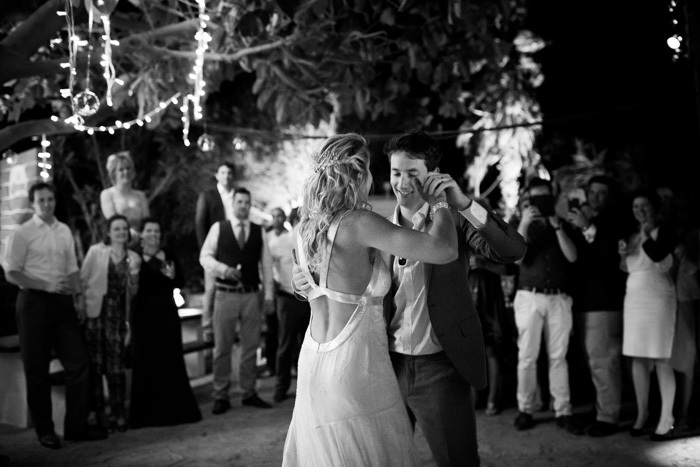 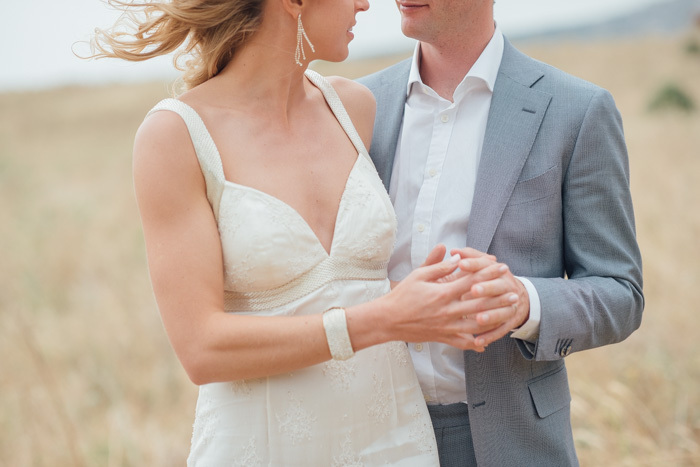 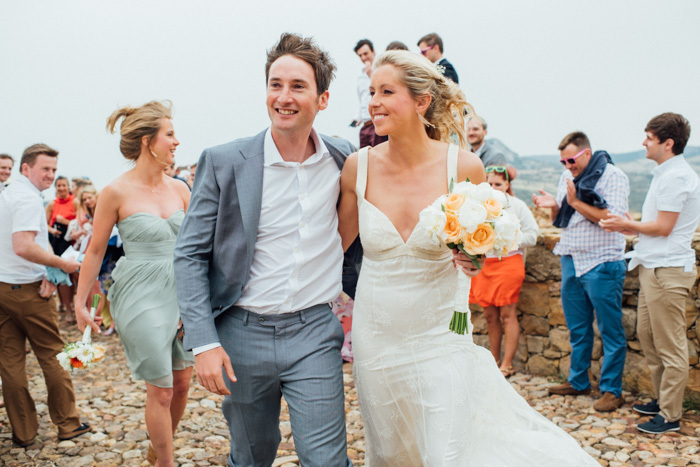 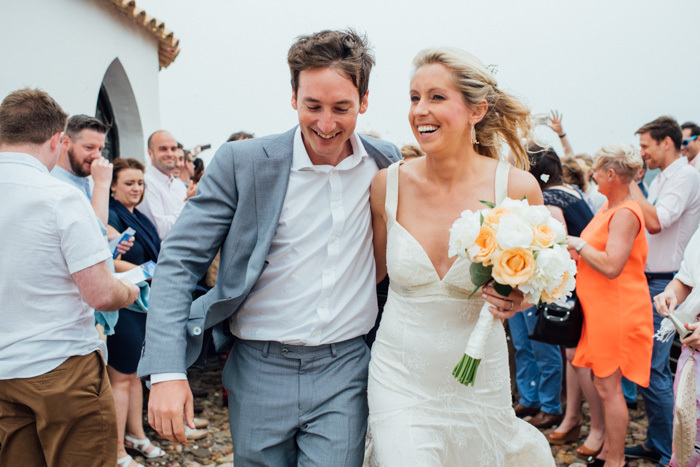 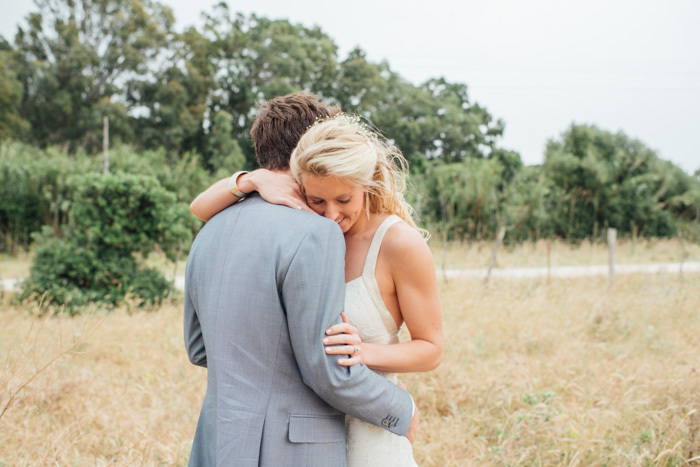 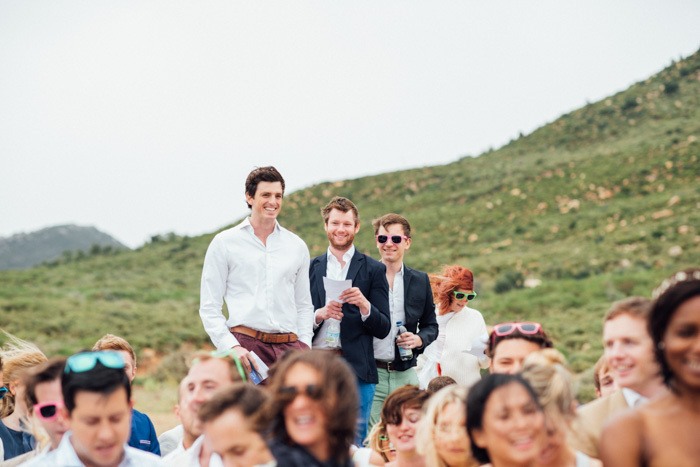 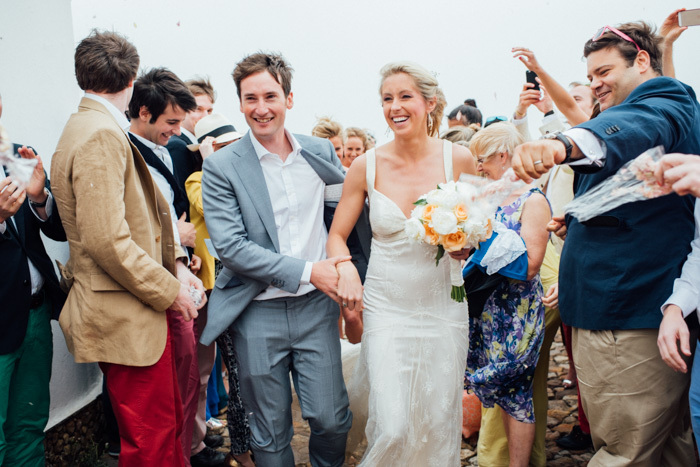 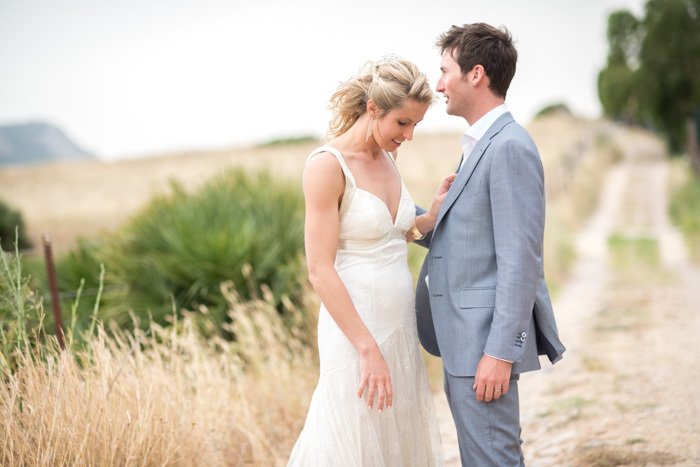 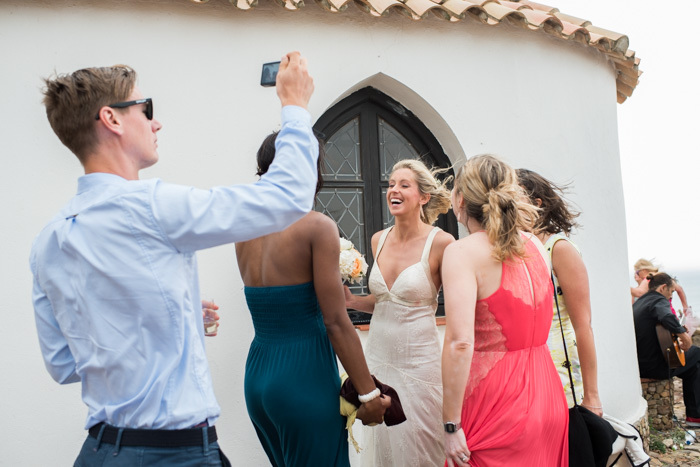 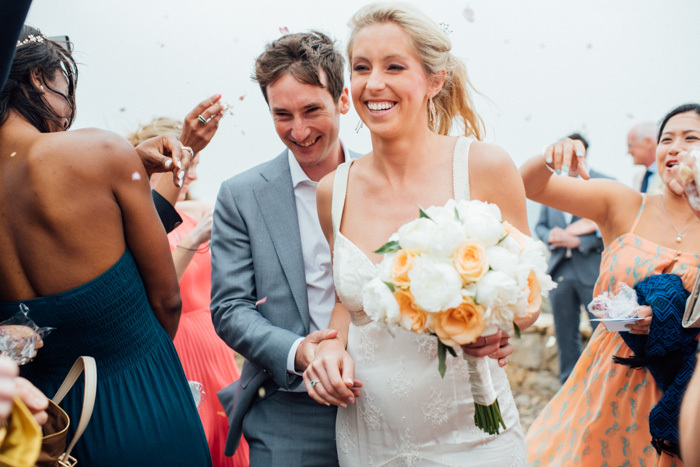 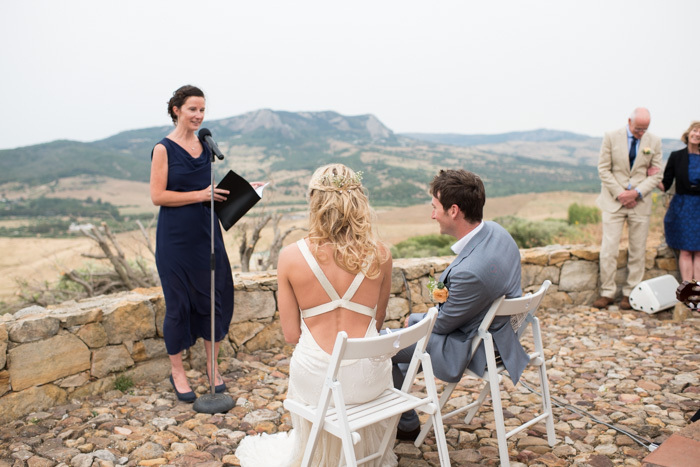 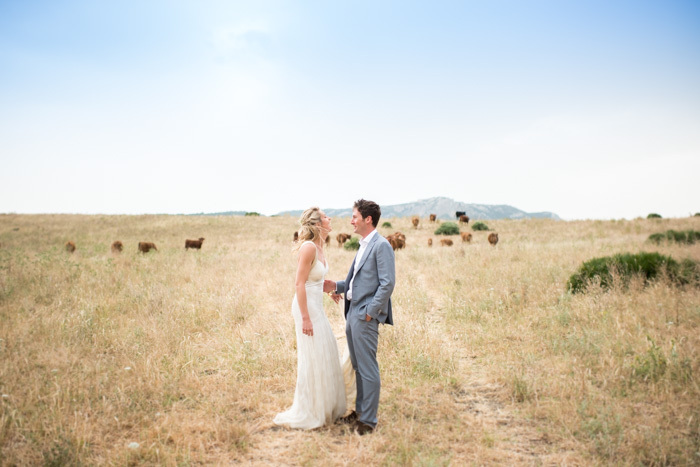 Ben and Karen are keen surfers and are really sporty, which is why Tarifa was their first choice for a wedding in the south of Spain. 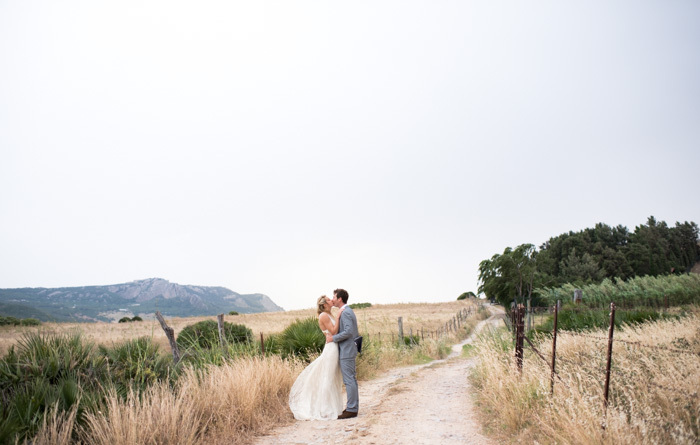 They chose me as their photographer because they could see that although I’m a Catalan wedding photographer from Malaga – I’m a free spirit at heart, and they really enjoyed my love for capturing the unexpected and knew I would be able to document their special day in a fun and relaxed style. 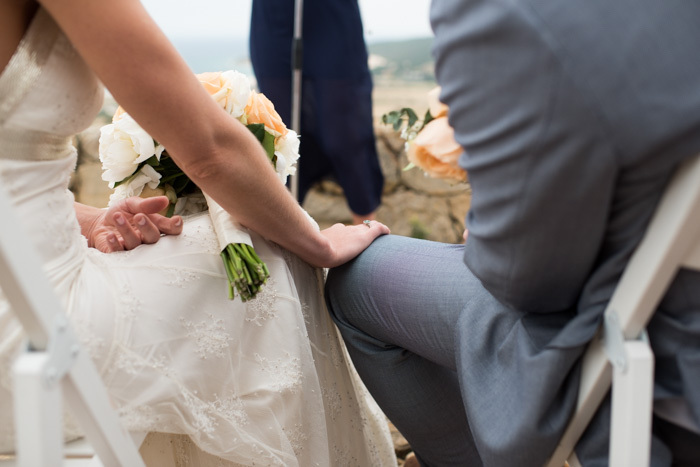 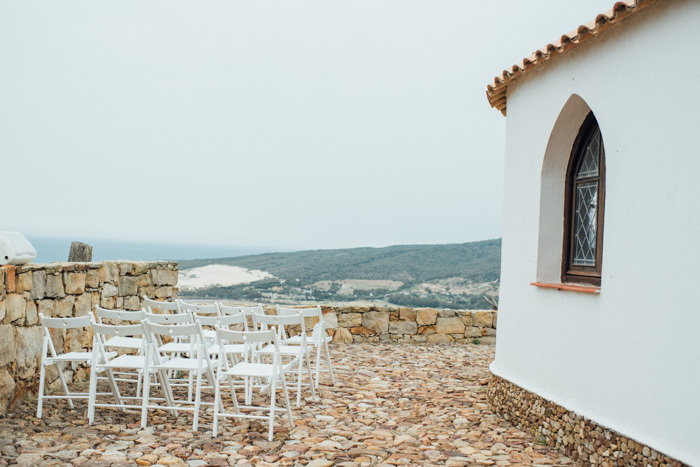 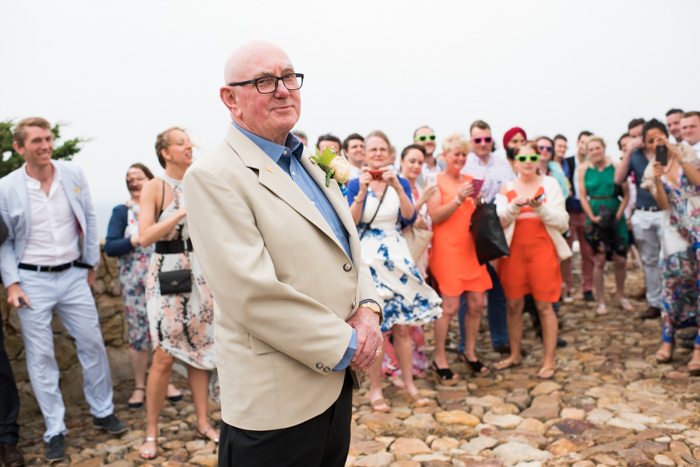 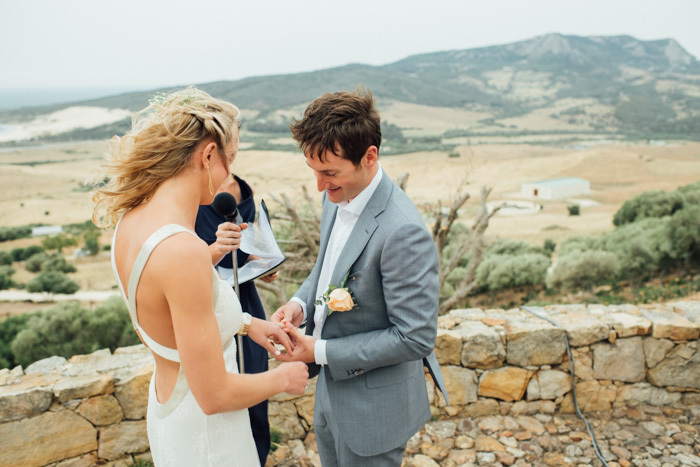 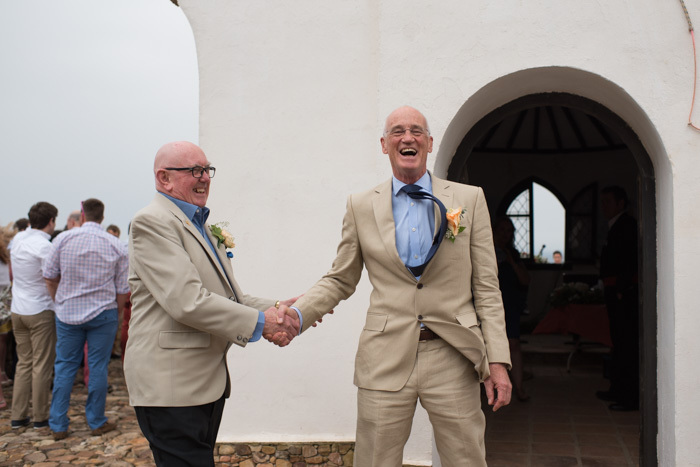 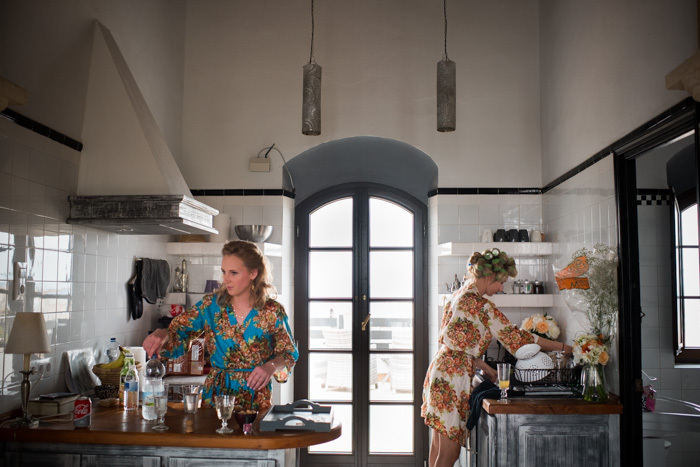 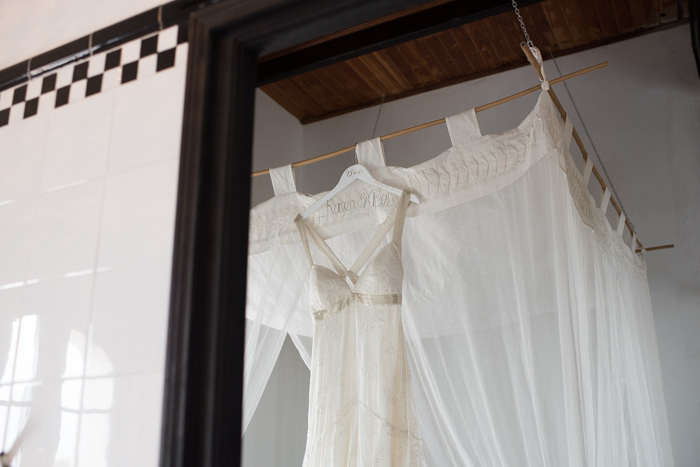 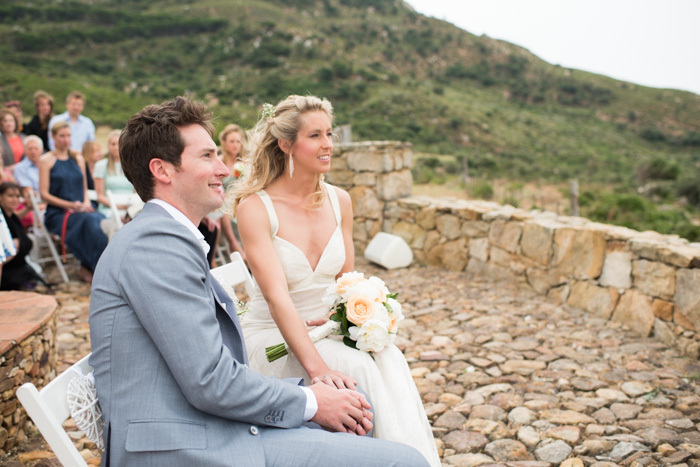 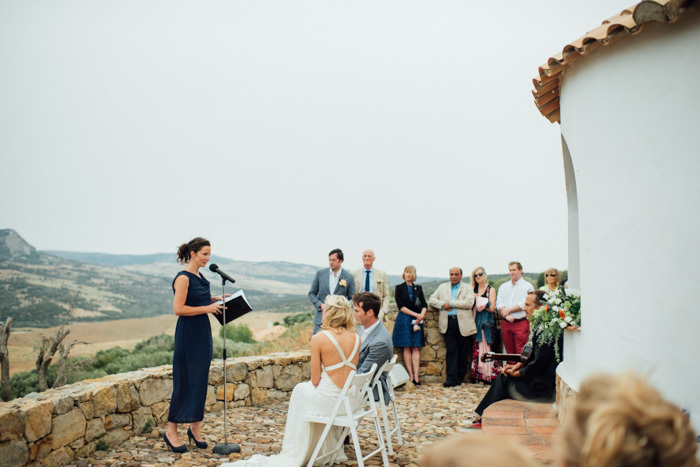 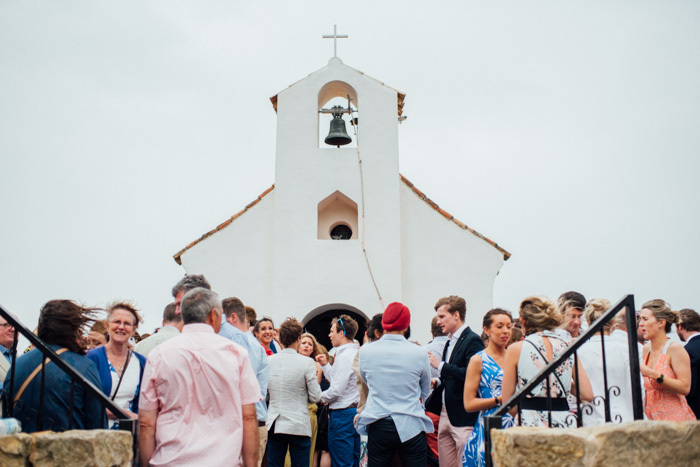 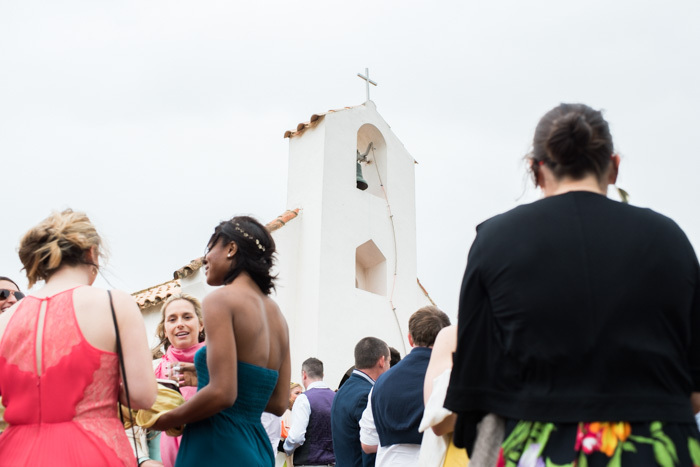 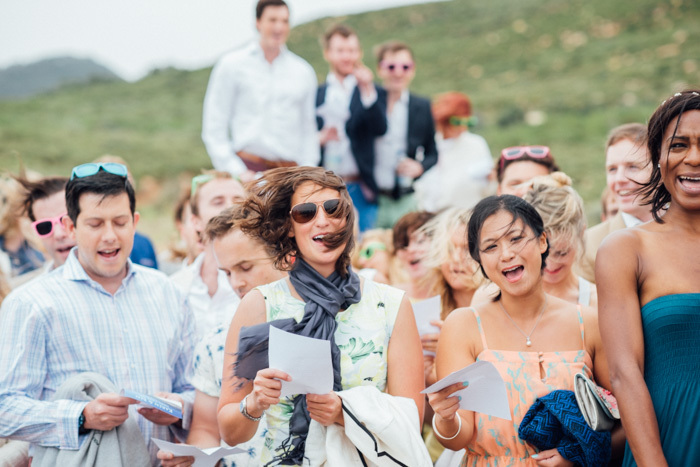 Ben and Karen got married in a unique chapel perched on top of the mountains overlooking the bay of Tarifa and Valdevaqueros Beach. 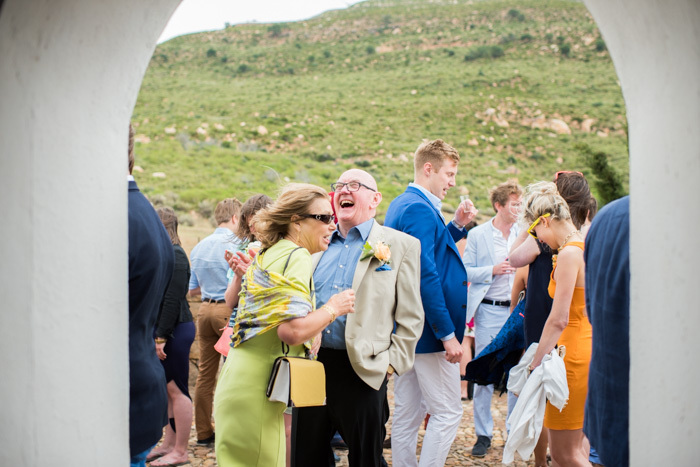 It’s one of my favorite locations for a ceremony as it always blows the guests away – even though on this day they were literally being blown about! 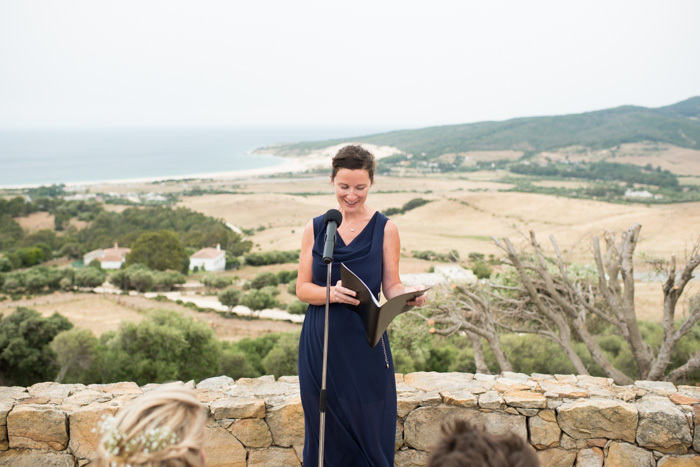 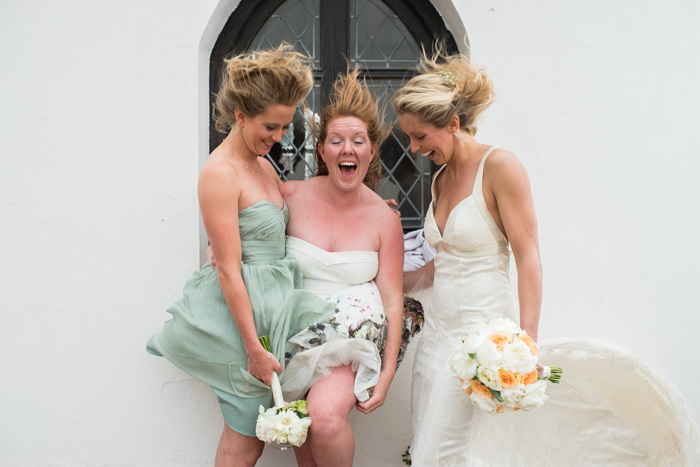 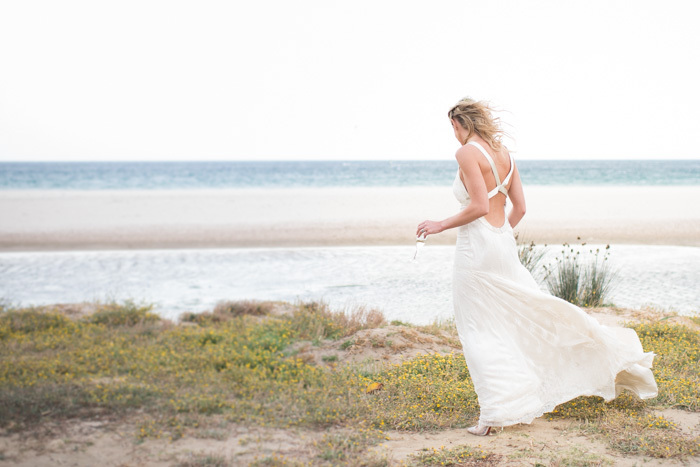 Tarifa is known for its windiness, which is great when you surf and want waves – but not so good for a wedding photographer from Spain. 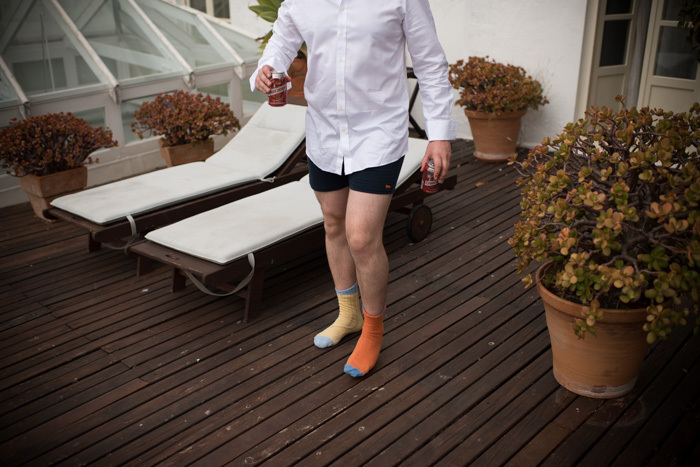 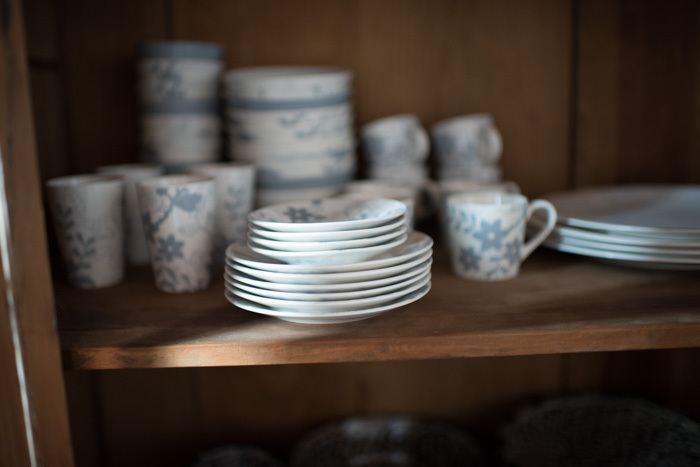 But I’m pretty adaptable and in the end it made for some great moments in the day and some really funny images. 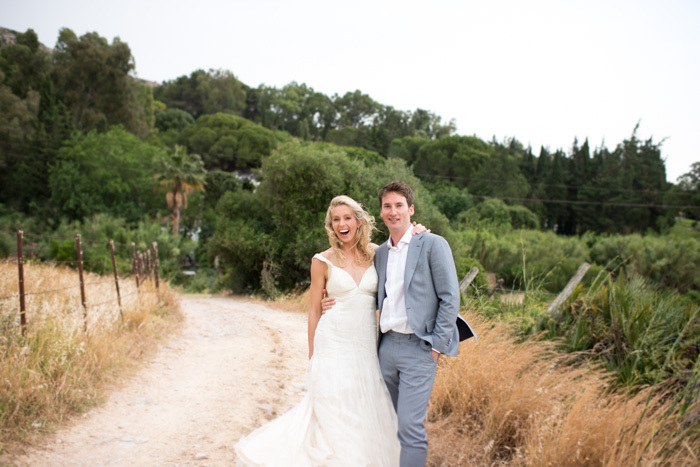 Karen looked amazing in her Amanda Wakeley dress and her Louis Vitton shoes. 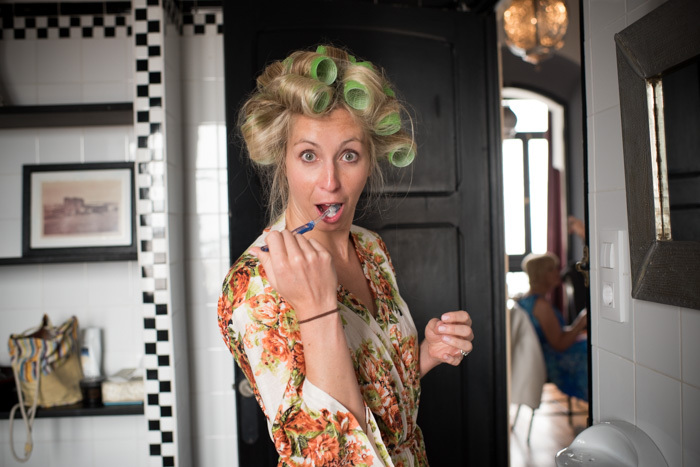 You can take the girl out of London but you can’t take London out of the girl – even in hippy Tarifa she was dressed to impress. 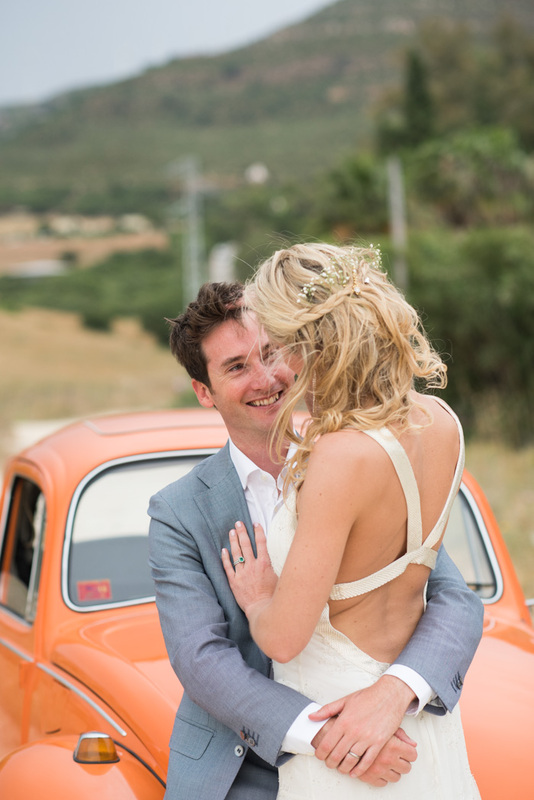 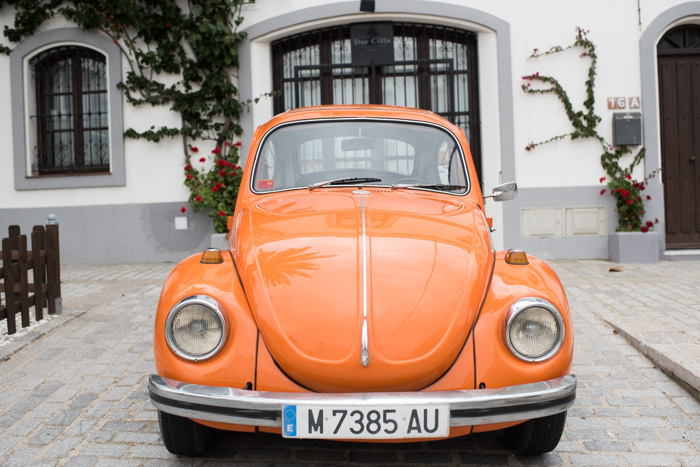 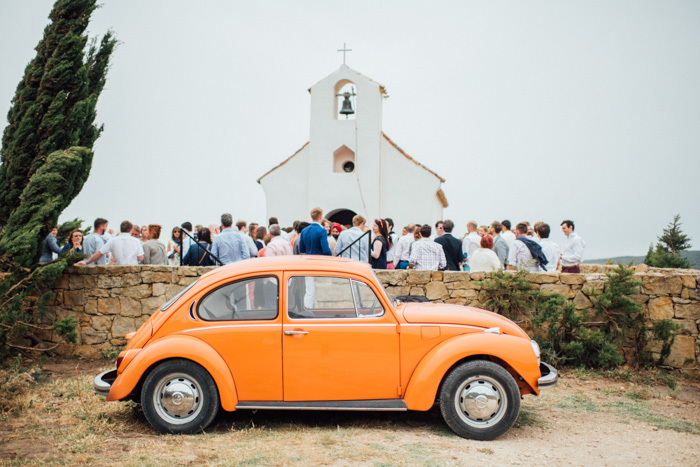 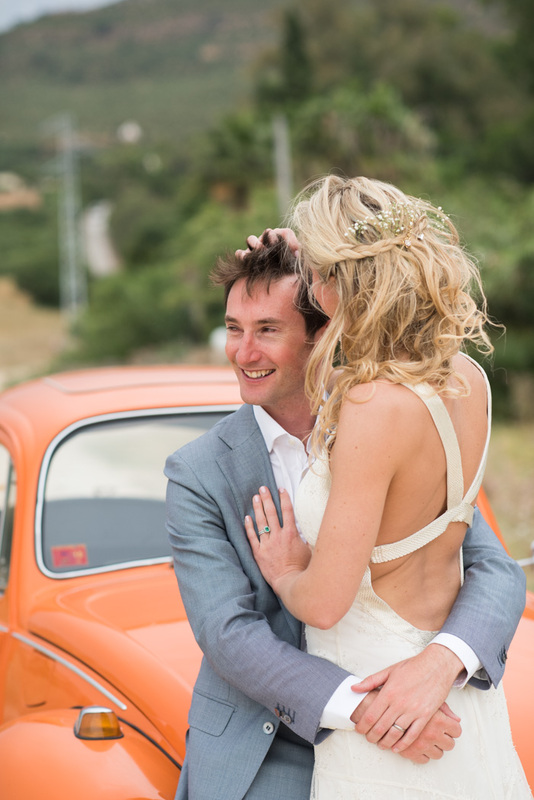 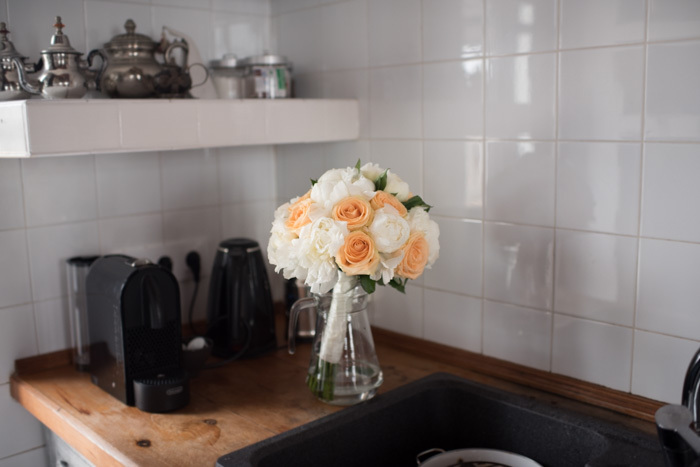 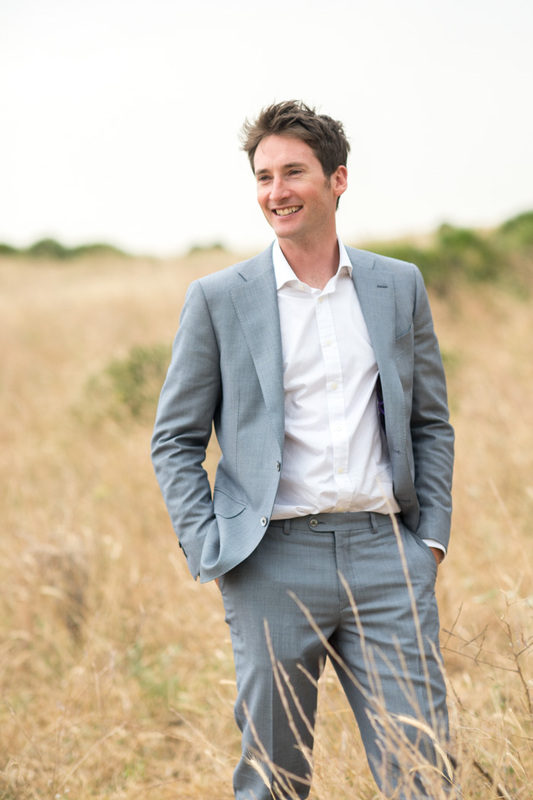 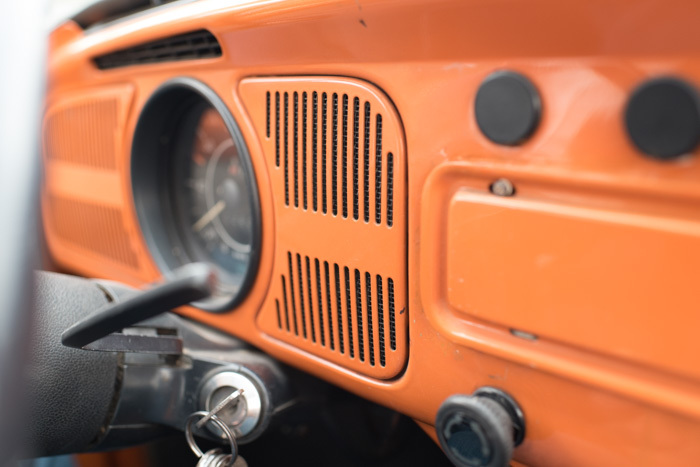 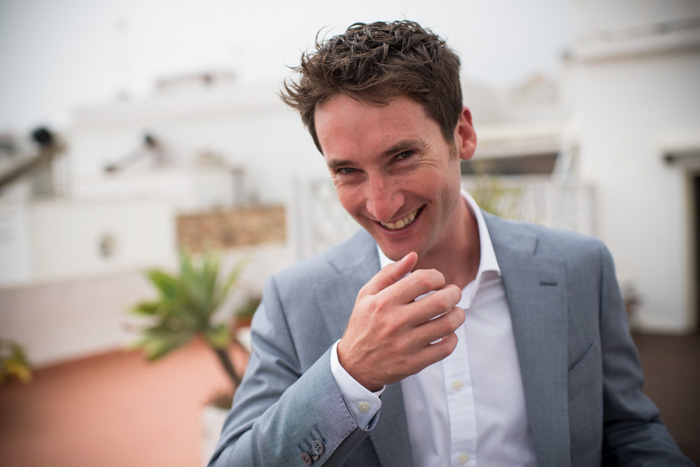 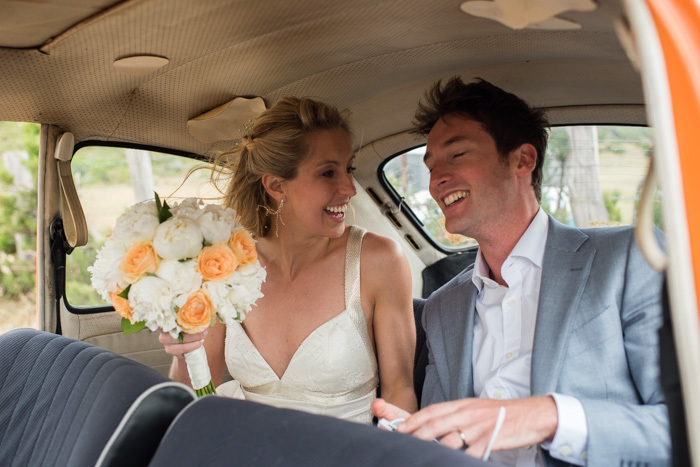 Ben wore a smart casual blue suit with no tie, and the bride arrived to the church in a bright orange vintage VW Beetle. 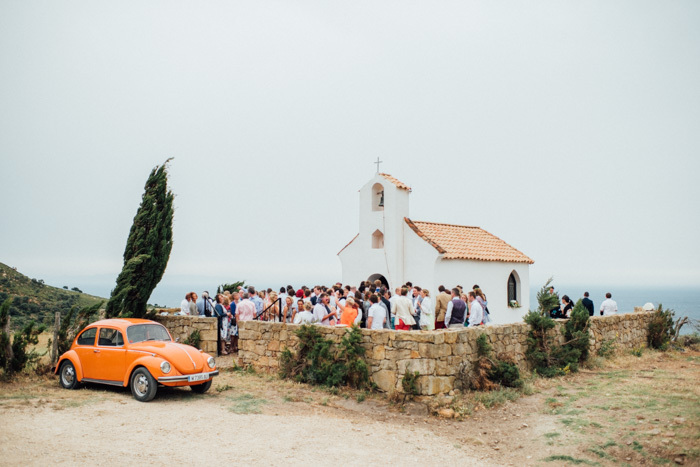 I was loving the fun mix of chic and Boho and the chapel looked so cool with the bright retro car parked outside the quintessentially old Spanish building. 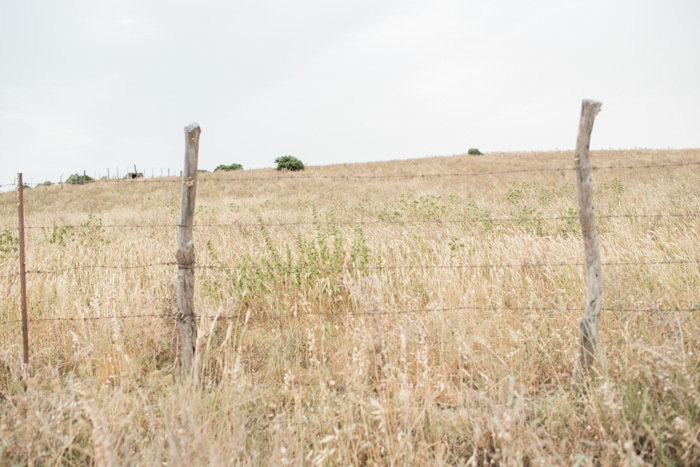 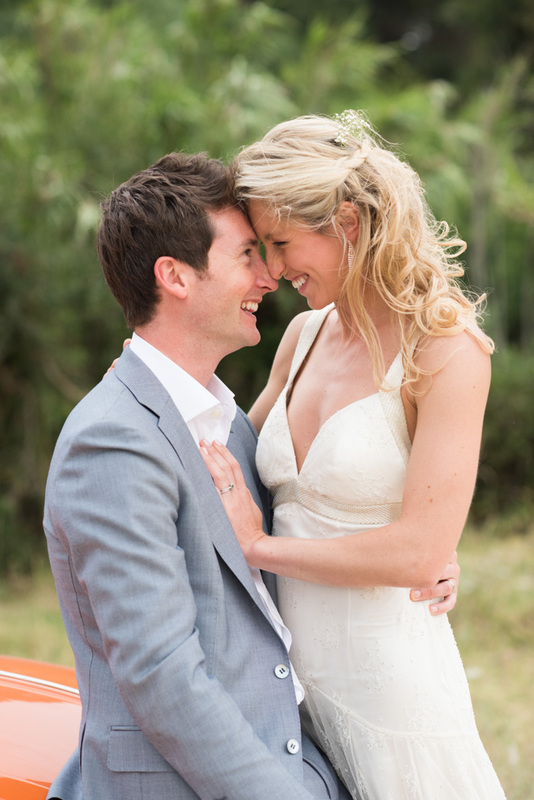 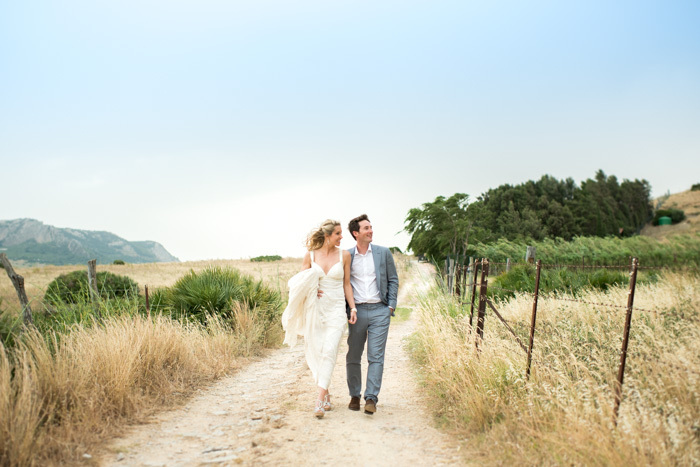 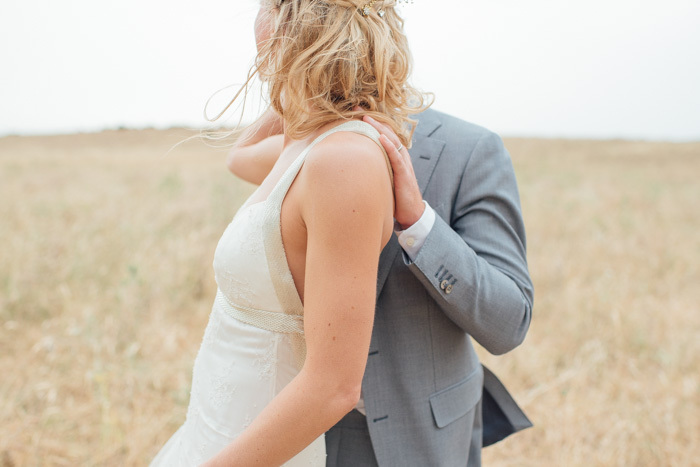 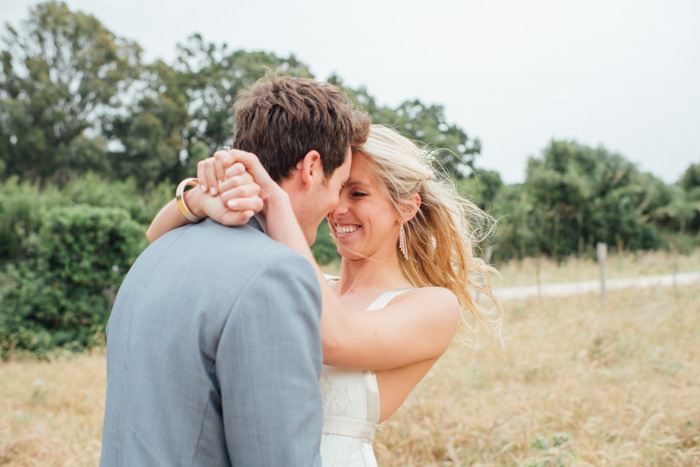 I had a great time photographing the Ben and Karen for their romantic portraits in the surrounding Tarifa countryside. 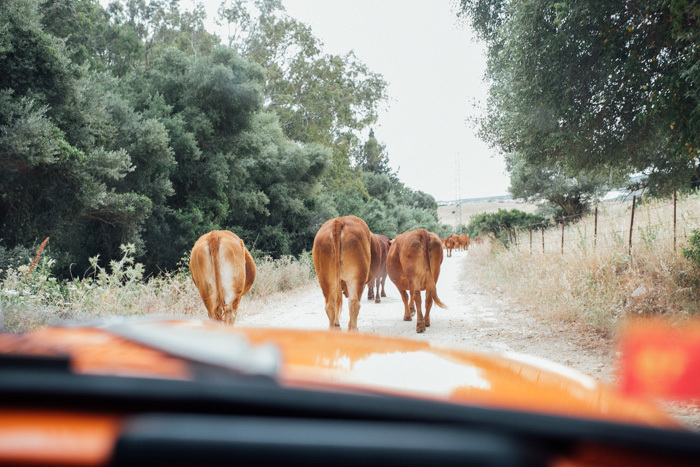 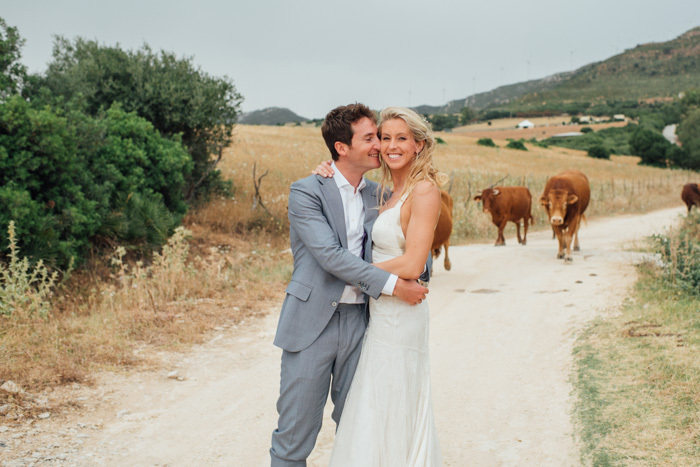 It’s not often as a wedding photographer in Spain that you are surrounded by so many cows, but it was hilarious and I think the fun we had is really evident in the photography. 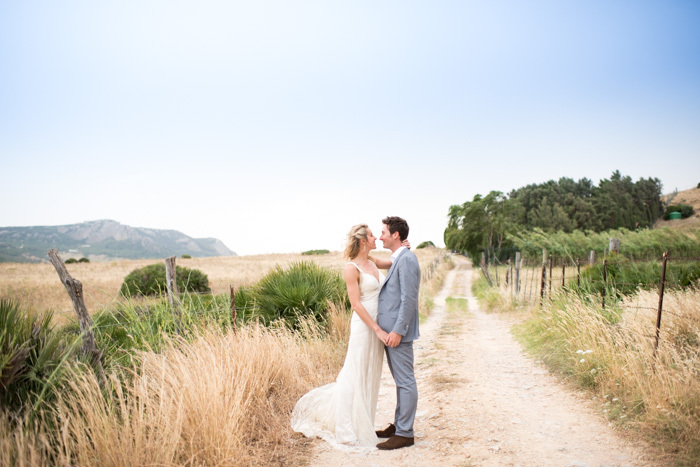 Not many bridal couples can say they had such a great backdrop for their photos! 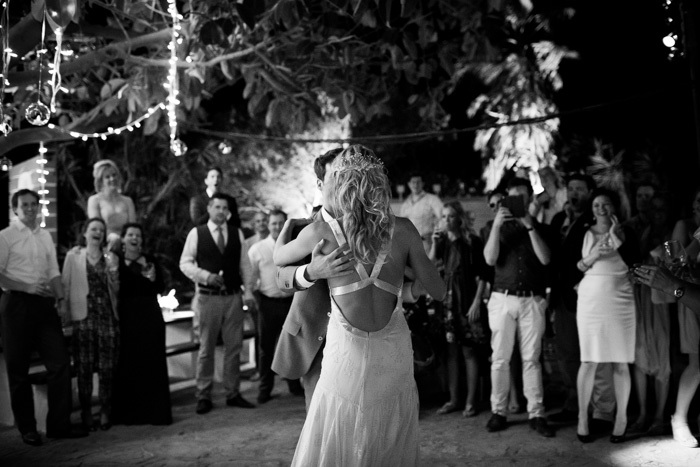 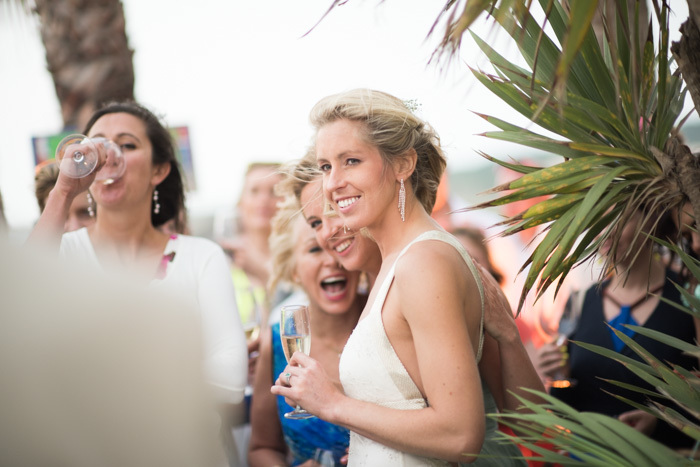 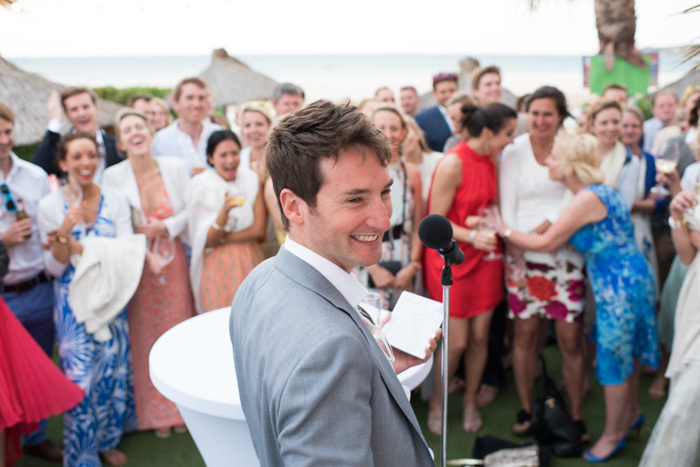 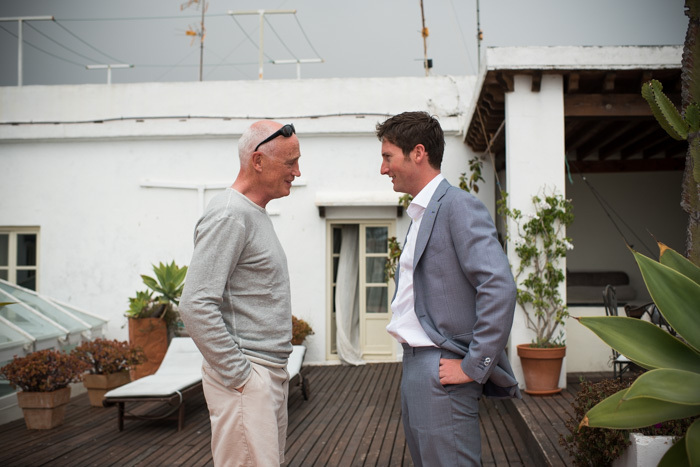 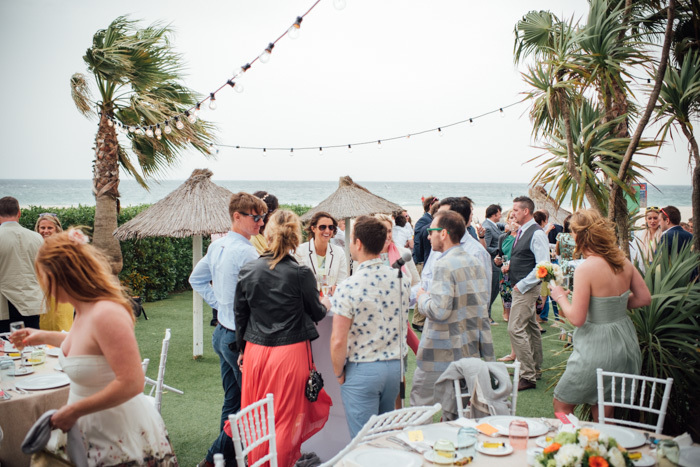 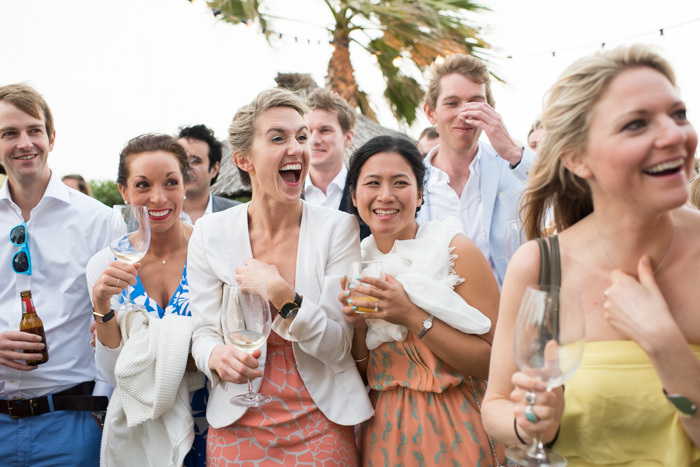 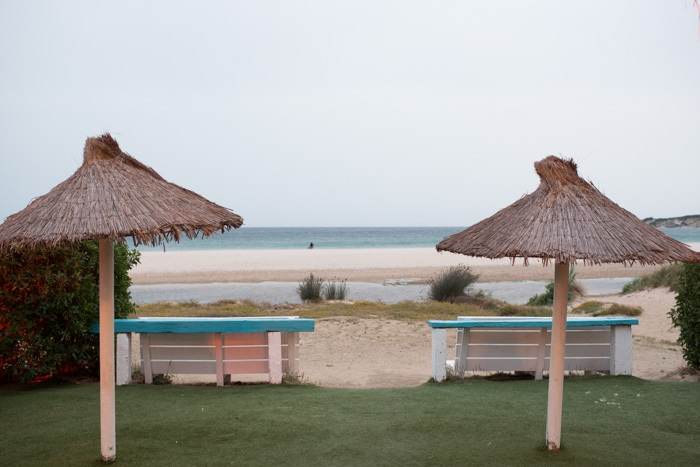 Following the ceremony, the celebrations were held in Tangana Beach – a typical surf shack chiringuito on the beach. 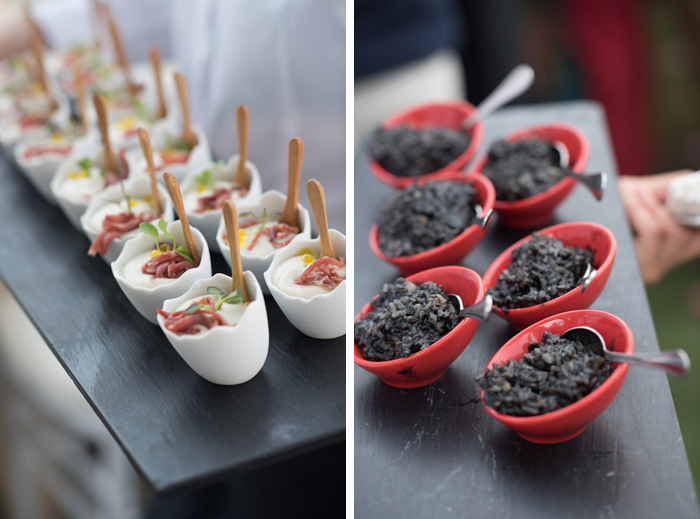 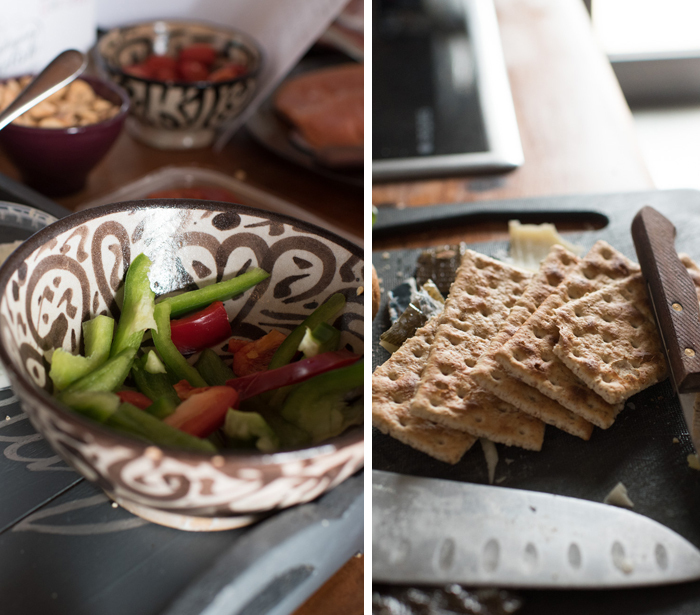 But even though the venue was relaxed and informal, it was luxury all the way with Goyo Catering’s array of mouthwatering dishes and canapés. 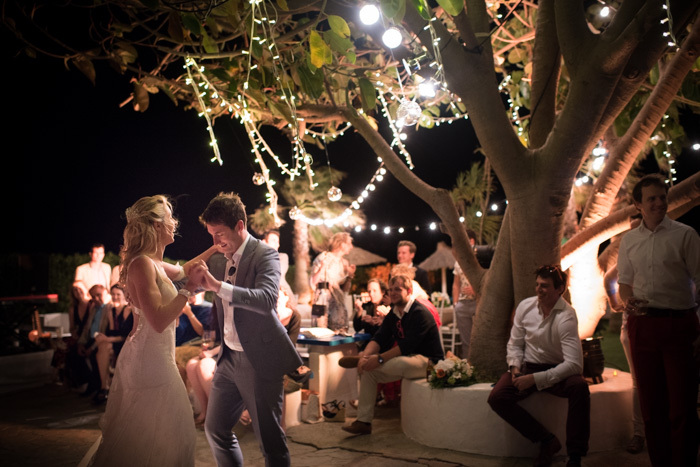 As the day turned to dusk, the trees were lit up in fairy lights and guests danced the night away to the sound of the waves. 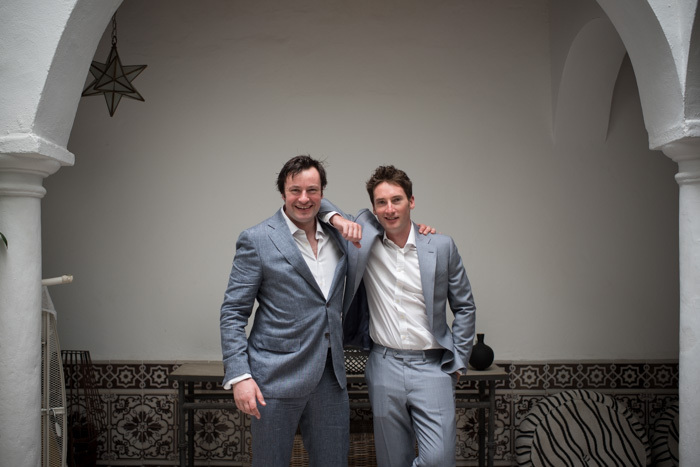 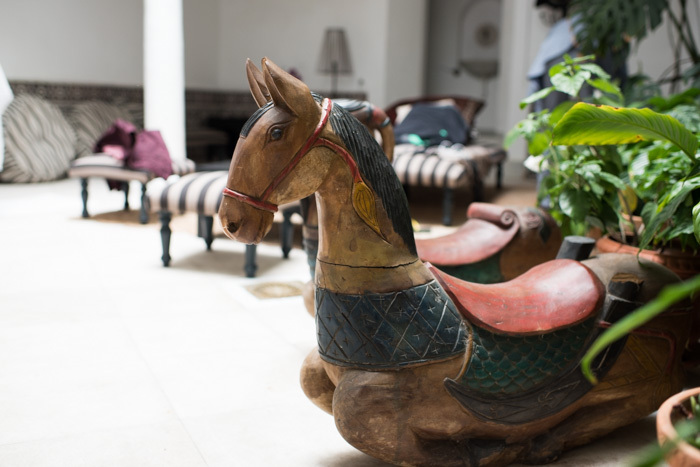 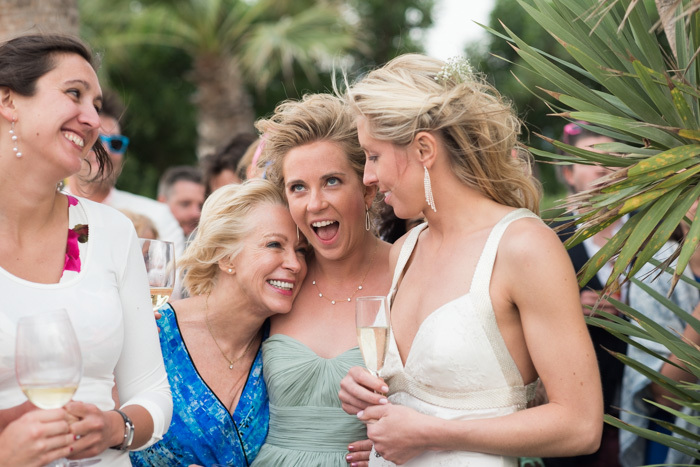 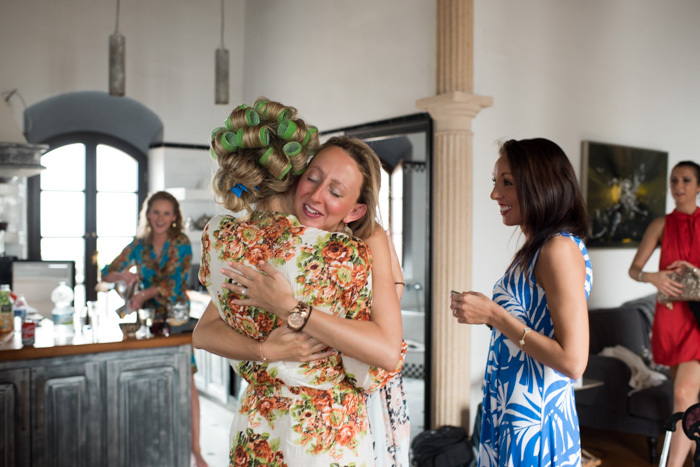 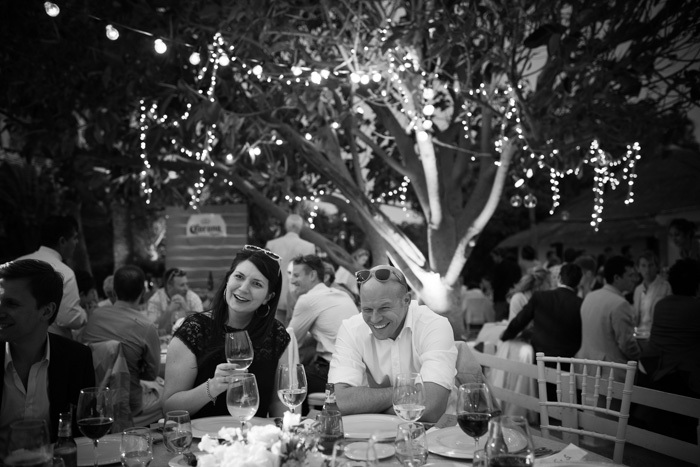 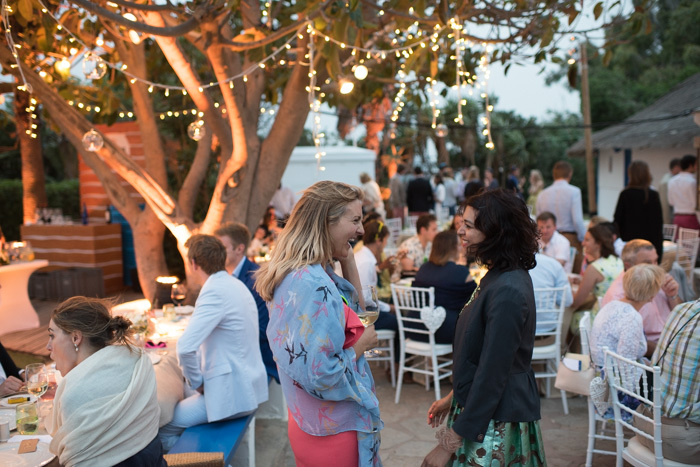 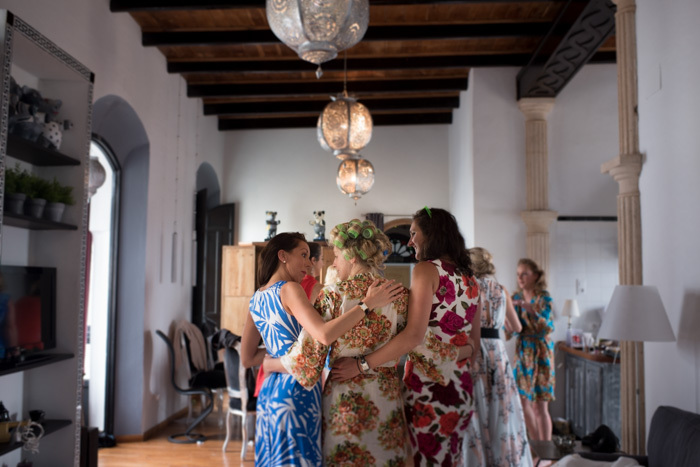 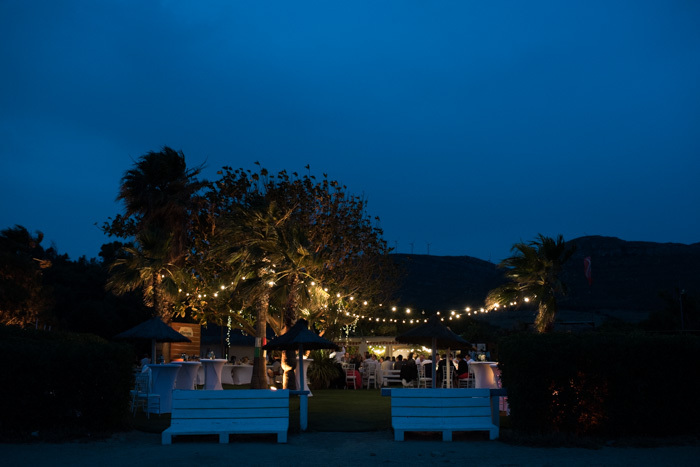 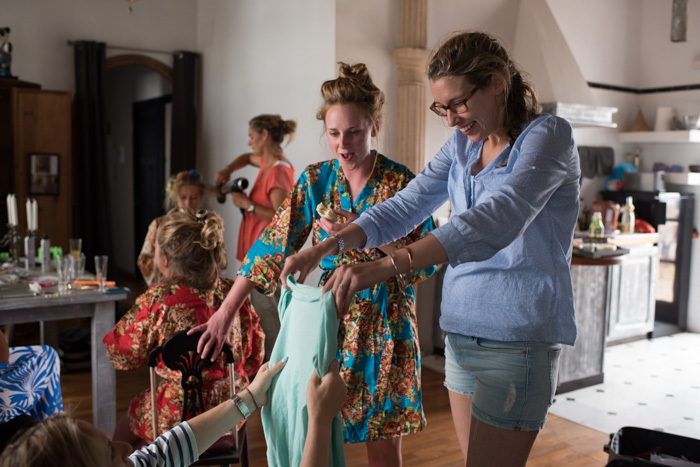 Another impeccably organized wedding by the wonderful Jolanda at Tarifa Events, and another amazing wedding in Tarifa…my favourite boho retreat! 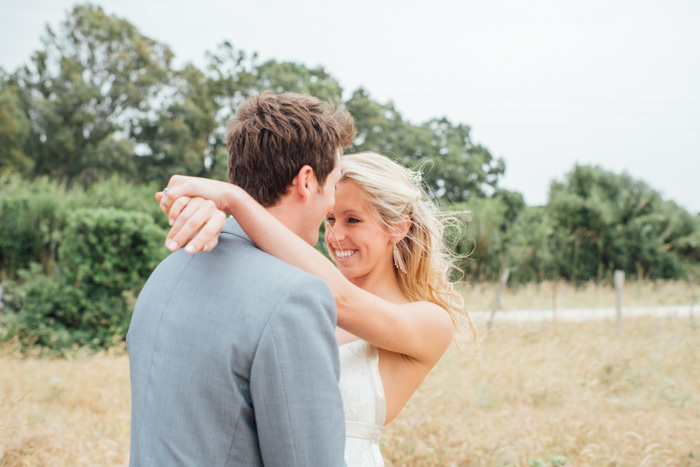 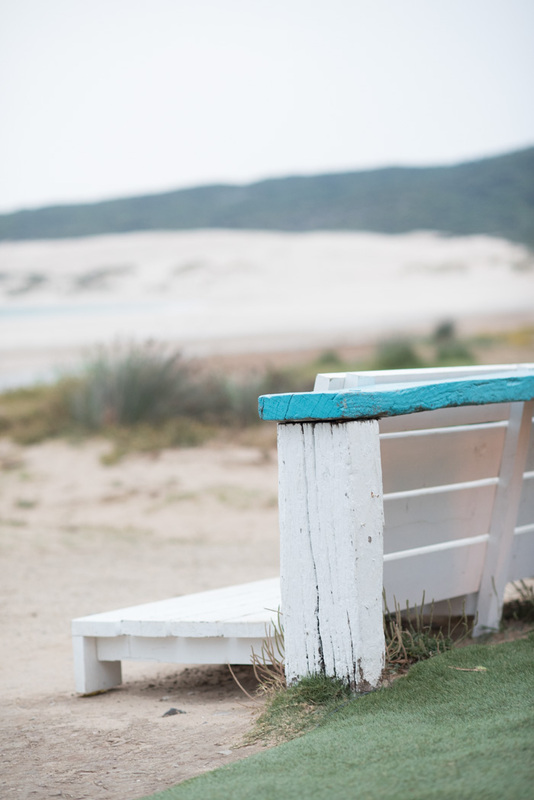 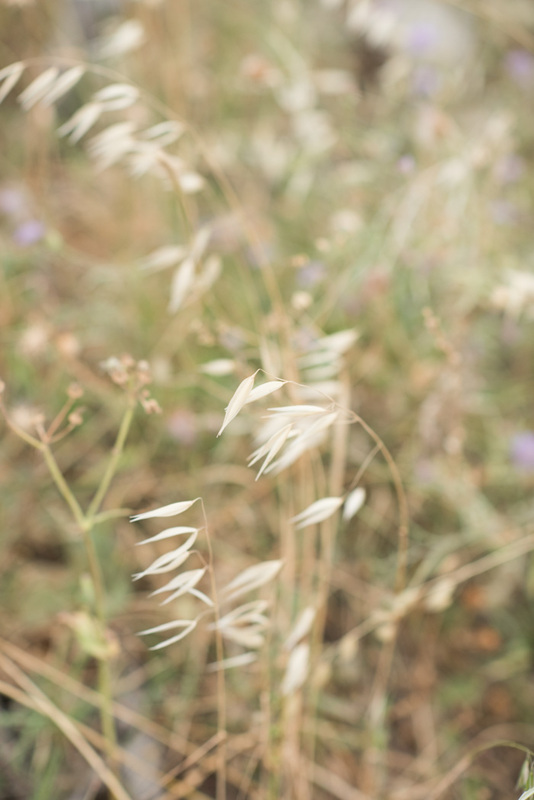 You can see more of this amazing couple in the prewedding session we did in Tarifa here.